This week I looked after a couple of my daughters friends. My daughter wanted to ice cupcakes with them so we baked them the day before and had all the supplies ready to go for when her friends arrived. 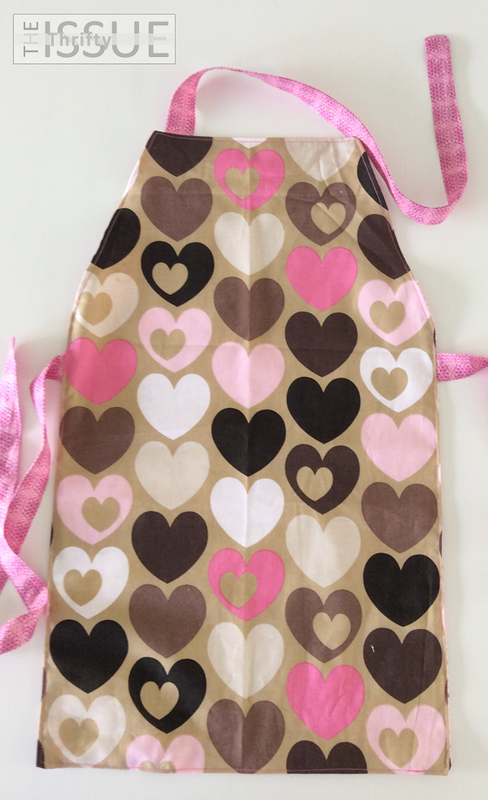 I didn’t want them to get their clothes stained with food dye so I made reversible child size aprons for them to wear. 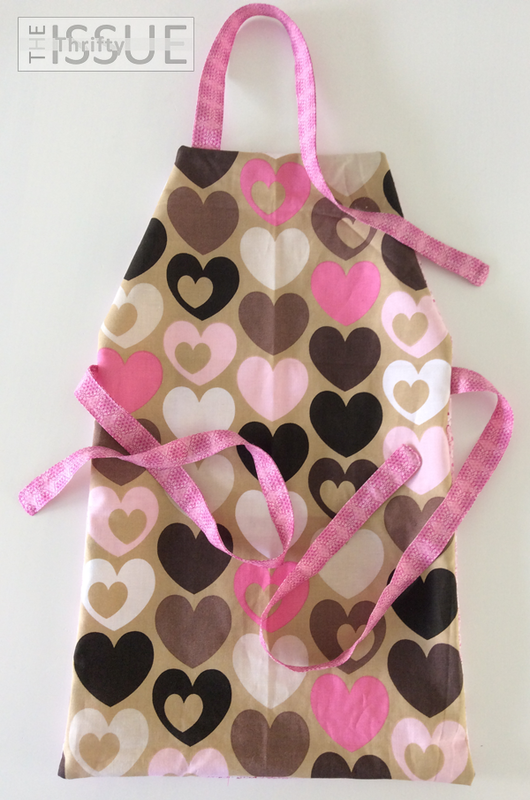 My kids have always loved the feeling of being a chef by wearing their own apron. Here is a quick tutorial on how to make your own and you can make any size you need using the same method. I also make it with an adjustable neck strap so that it lasts longer and you don’t need to worry about head sizes. The amount of fabric will depend on the size you make. My daughter and her friends are 3yrs so these ones will fit a 2-4yr old. To find your size take one of your child’s tops and turn it inside out. Fold it in half length ways and fold in the sleeves. I generally add an inch to the bottom for each year of the child’s age so for this one I added 3 inches as my daughter is 3. 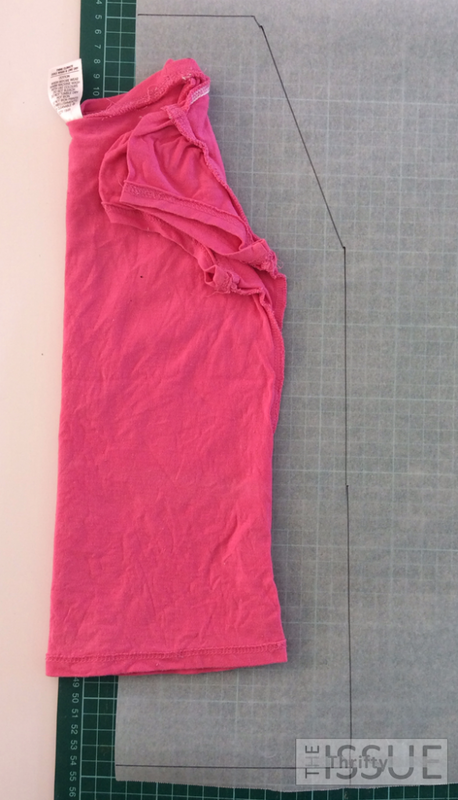 Trace around your top with the extra length on to baking paper or similar and cut it out. Mark your pattern with the word FOLD on the long side. 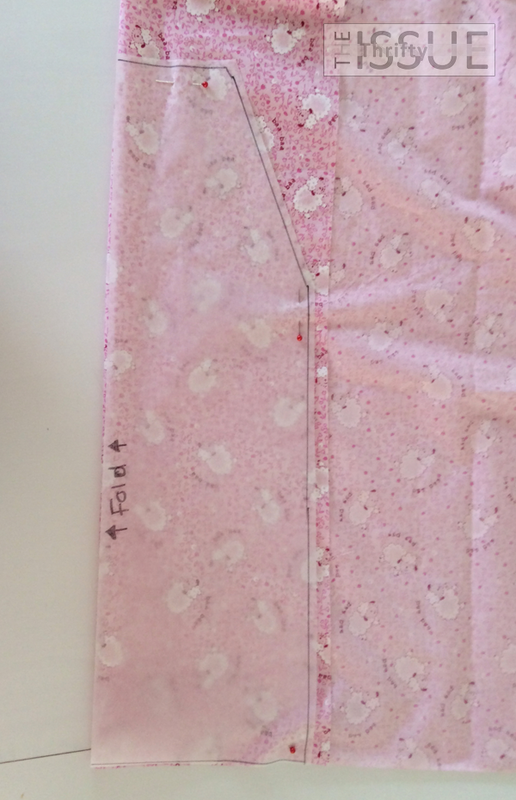 This will help you remember how to place the pattern when putting it on the fabric. Next fold your fabrics so that when you place the pattern piece on top you can line up the fold with the word FOLD on the pattern piece. 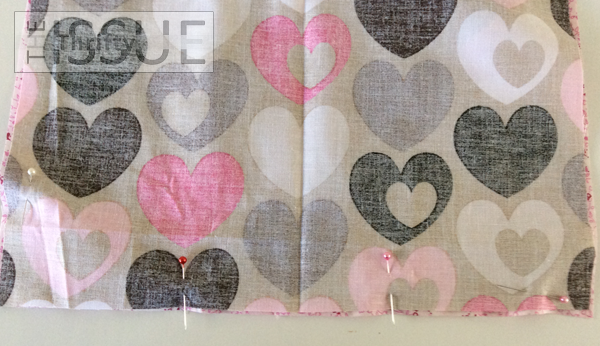 Pin it and cut out one of each fabric. 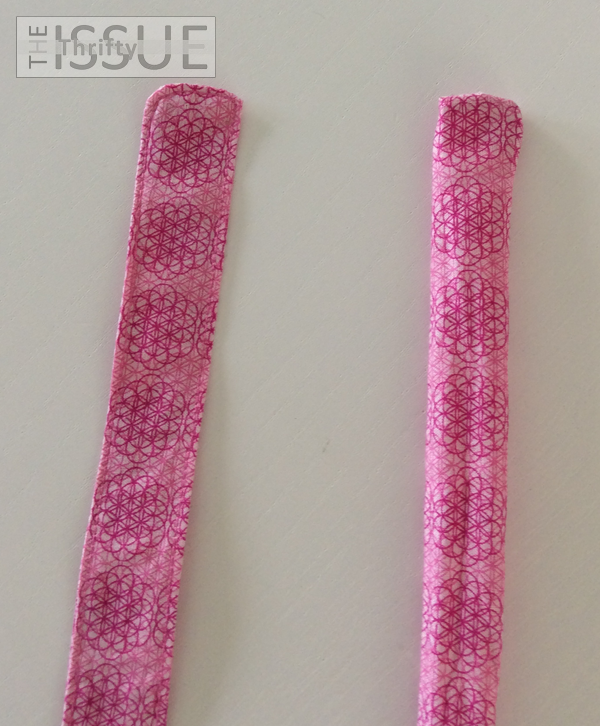 If you are making your own ties also cut out strips at least 8cm wide. You will need 3 strips one for each side tie and one for around the neck. To make your ties fold the fabric in half lengthwise, right sides together and sew one end and the long side together. Turn the ‘tube’ you have just made inside out. I use a chopstick poked into the sewn end and then pull the tube over the whole stick. 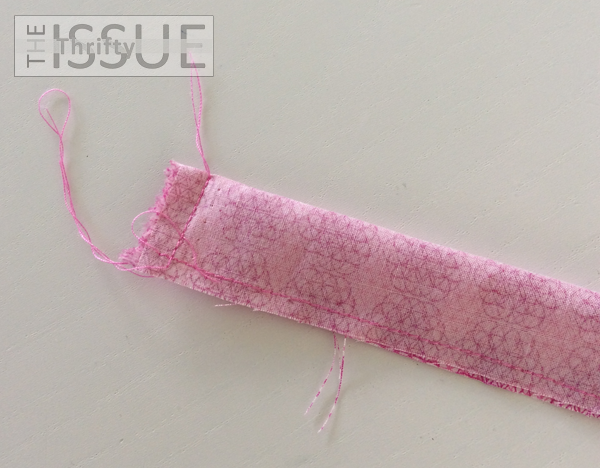 Iron your tie flat and top stitch as close to the edge as you can. Top stitching is an important step as it helps the tie hold it shape and gives your apron a more finished or professional look and feel. See the difference in the photo? Once you have your ties ready lay one of your apron pieces on the table right side up and position your ties. One on each side of the apron and one at the neck. Make sure that the bulk of the tie is pointing into the apron or you won’t be able to tie your apron when it’s finished. Also only have one end of the neck tie in position. Lay the second apron piece on top right side down and pin in place. Leave a gap at the bottom marked with either 2 pins or place your pins in a different direction so you remember to leave it open. Sew around the entire apron except for the opening you just marked. When starting and finishing your sewing go back and forth a few times to secure the thread. My machine has a stitch selection for this, if yours doesn’t just reverse over it a couple of times. 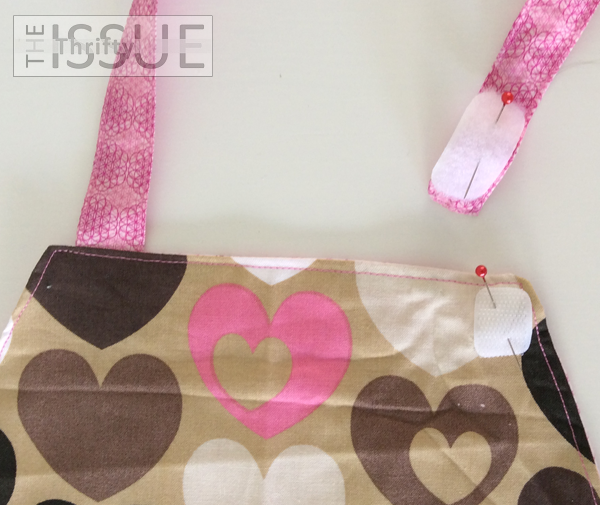 Turn your apron in the right way by pulling it through the opening. Use a chopstick to poke all the corners out to make them sharp. 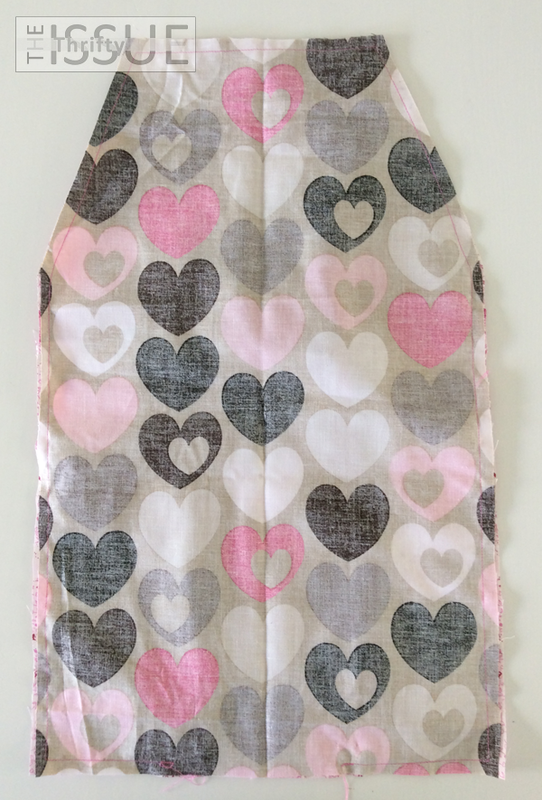 Iron your apron again to get all the edges as flat and crisp as you can. Be careful when you iron the opening as the cease you make now will determine how the bottom of your apron will look in the end. Top stitch the whole apron as close to the edge as you can. Next we add the Velcro to the next tie. Cut a small square of the scratchy side of the Velcro to place on the apron and a longer rectangle of the soft side to put on the strap. If your Velcro is wider than your strap just trim it down, Velcro doesn’t fray. I also like to round the corners so it doesn’t scratch anyone. Pin it in place then sew around both parts and you are all done. 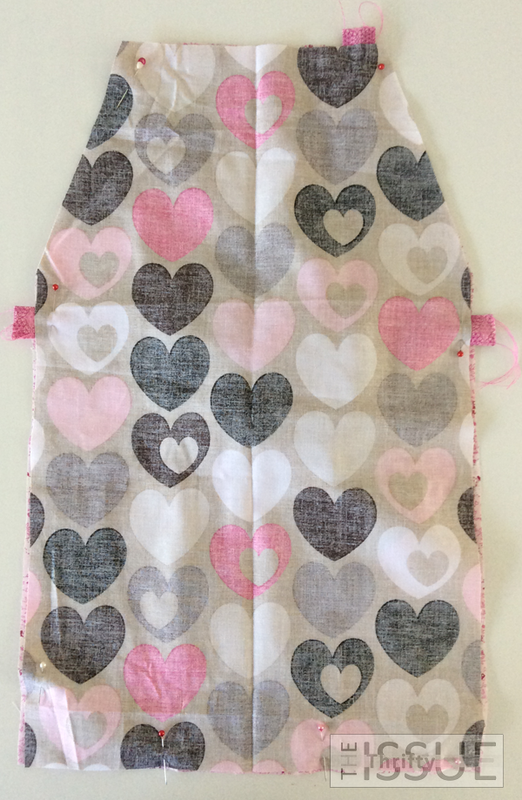 You could also add a pocket or two or use a laminated fabric to make it water resistant for an art smock. I find it a cheap way to give a gift that has a licensed character without breaking the budget. I’ve given these to both boys and girls, all little kids love to cook I find. 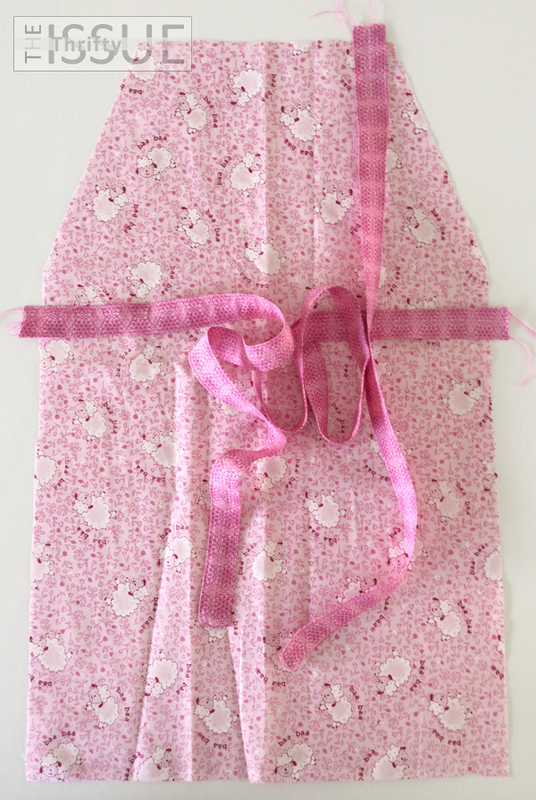 Of course, you could also make it in adult sizes, just extend the length to the desired size. What do you like to sew? 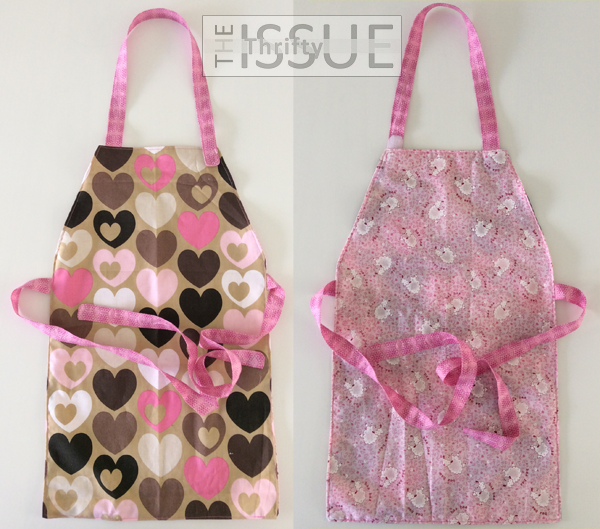 Do you use an apron in the kitchen?